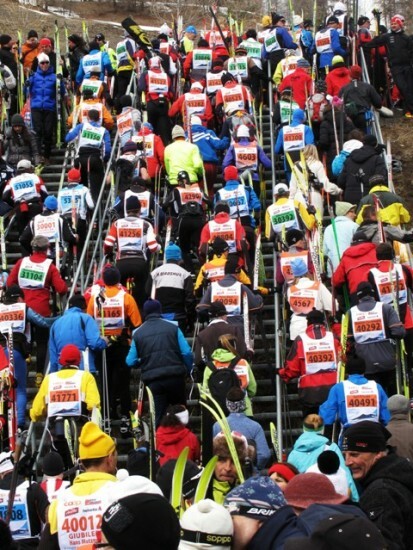 The 2011 Engadin Ski Marathon is in the books. I’ll post a full race recap once I return home, detailing my breakaway with eventual race winner Remo Fischer, as well as some other stories. For now, I’ll share some photos and brief commentary of the race day festivities. 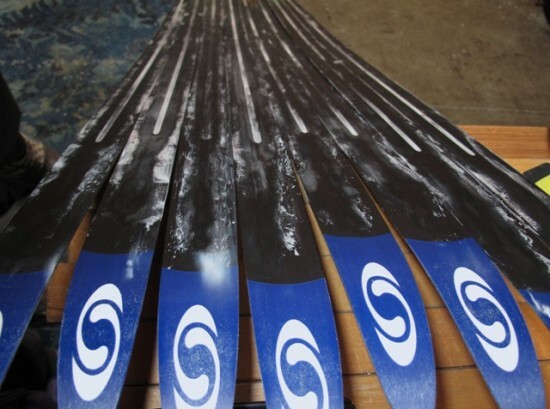 Skis were prepped and powdered the morning before the race. Surprisingly, there was much less stress about waxing for this race than there seems to be for the Birkie. By 7pm when I walked past the wax room, everyone was done waxing and in the restaurant enjoying dinner and the company of their companions. Race day itself, I felt like everyone was being herded like cattle: onto the bus, to the bag drop, into the start pen, and off on course. None-the-less, being around 11,000 other skiers from around the world is pretty cool. I also ran into a number of friends, both American and Swiss, and even made a few out on course. Post-race is all about refueling and re-hydrating. Also, you don’t want to forget to get your Passport stamped. 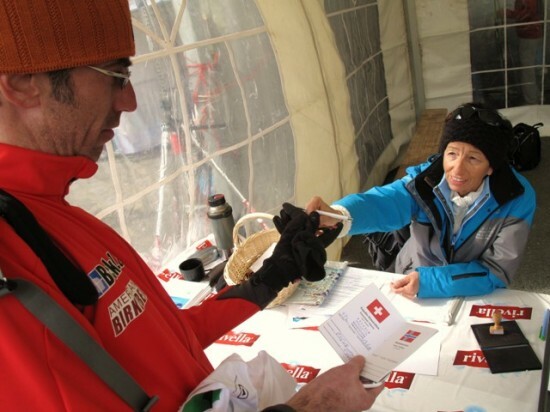 Here, Worldloppet Master Scott Ackatz gets his Passport stamped for his second tour of the Worldloppet circuit. These were two of the friendliest “customs agents” I’ve ever met. Pretty standard here in Switzerland. After the race, we avoided the crowds and walked to the Scaletta (the Engadin equivalent of the Moccasin) in S-chanf for some drinks and pizza. Don’s old friend and owner of the Scaletta made sure we were taken care of on all fronts. While it ain’t no Ideal Market we enjoyed some post-race brick-oven pizza. 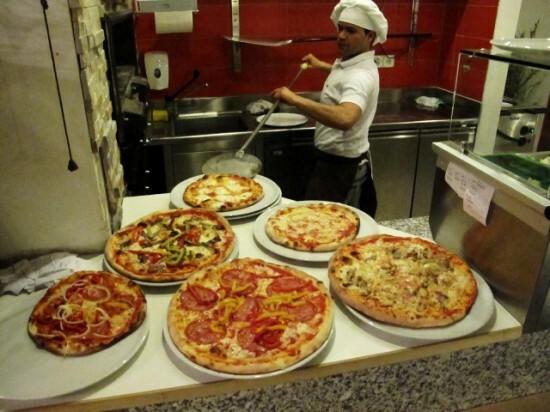 Mamma mia, pizza pie-a! From here, the crew is off on a variety of adventures. 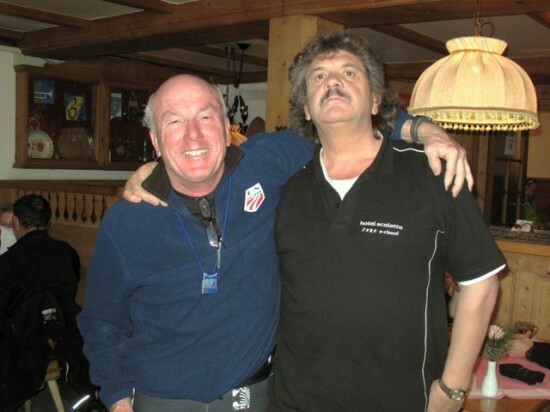 Don’s off to Bormio and Aga’s off to Lugano; both are meeting up with friends for a few days before meeting with CXC Masters Oyvind Solvang and Dennis Kruse in Lillehammer for the Norwegian Birkebeiner. Jim and I are off to Zurich tomorrow, then have to bid adiu to Switzerland and head home to Wisconsin. It’s been an eventful and successful, albeit much too brief, week in St Moritz. Thanks for following our adventures and, to anyone we’ve met this week, don’t hesitate to send an email and say hi: garrottkuzzy @ yahoo.com. Onward!